Nobody asked for this, but I’m writing it anyway because (1) I enjoy writing, and (2) My post about Concavenator is taking longer than expected. So here’s one of those long, rambling gaming updates where I talk about what I’ve been playin’ and you all get to sit here and listen. I’m about two years too late, but hey, Fred Meyer was virtually giving this game away, quietly pleading for its customers to take heed this Great Deal and free up shelf space for better software like Daisy Fuentes Teaches Pilates. You might think I made that game up, but I did not. It’s sitting there for you to buy. I do not object to the inclusion of Daisy Fuentes, but the very fact that a Pilates game exists makes me shudder with fear. This is an activity best served on Microsoft’s upcoming failure, Kinect, rather than the Wii Balance Board. Anyway, back to The Conduit. 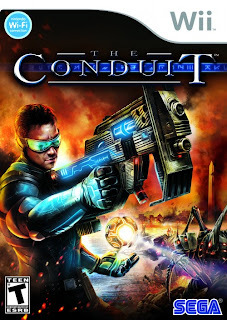 Despite early hype back when it was released in 2009, The Conduit is very much a paint-by-numbers corridor shooter. It’s certainly not bad, but it’s not great either, and whenever the game escapes the confines of endless hallways and monster closets, bursting into larger outdoor vistas, it promptly falls flat. Eager to “push” the hardware, the developers revel in their ability to throw multiple high-powered enemies at you from all directions. Strategy has no meaning here—your only recourse is to “brute force it,” as they say, running amok, guns a-blazing, hoping you survive long enough to reach the next checkpoint. I have not partaken in The Conduit’s supposedly robust online multiplayer offerings, which includes Wii Speak support. My misgivings do not result from the game itself, but my own failures as an online shooter gamer. Previous attempts, which have been valiant, were given to Call of Duty 4, Halo 2, Halo 3, and Modern Warfare 2. All ended in tragedy. To be fair, I did somehow enjoy myself in all efforts, but it was clearly not where my skills existed. If forced to play a multiplayer shooter, I will choose something sufficiently old-school, like Turok 2 or Goldeneye 007, in which modern frills had not been invented, and my limited skillset leads to as many victories as losses, though that number, on average, is often skewed toward the latter. In the same way that the core Pokemon games dig their Razor Claws into my soft hide, Dragon Quest IX has proven to be an unwavering master. Though I recently completed the main story, my tasks are far from complete, as there are Quests to pursue, Alchemy to perform, and Grottos to explore and conquer. I have also been experimenting with the game’s many Vocations (jobs), taking my Lv. 45 Minstrel back down to a Lv. 1 Thief and leveling her up from there, to happy results—although I wish she could carry a shield. My goal now is fuzzy and undefined: leveling up and bettering my equipment occupies the majority of my time, and traveling to Grottos to find ever-rarer alchemical ingredients is a rare, but welcome affair. I have been wholly unable to make use of the game’s “Tag” mode, in which players can passively download maps where their DS systems sense each-other’s presence. Additionally, Dragon Quest IX features a unique local multiplayer system whereby two players can travel to each-other’s worlds, gathering alchemy recipes and finding items unique to that particular world. Alas, none of my DS-owning friends have any interesting in a traditional Japanese RPG, so I’ll have to wait until one of my NWR colleagues takes my offer of pizza and beer at the Mooses’ Tooth to get my multiplayer on. I’m taking a short break from the eternal grinding of the post-game material to experience the joy of Chrono Trigger (see below). 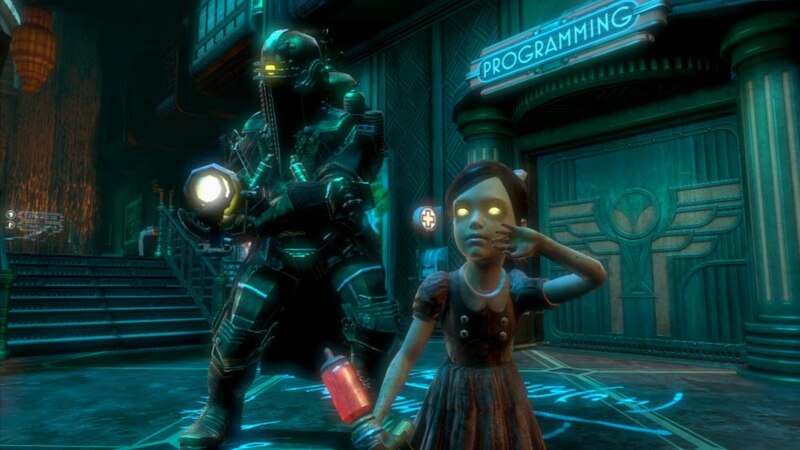 My adoration for 2K’s dystopian Bioshock brand is well-established. I’ve played the original brilliant game like three times. I’ve played its sequel through once, and tried on the multiplayer but felt it unrefined and, frankly, unnecessary. The developers have released two or three expansions and tweaks to the multiplayer game, but I was pleasantly Electro-Bolted last week to discover that they recently released a big beautiful single-player expansion called Minerva’s Den. For all intents and purposes, this is an original entry in the series, with little to no immediate connection to the events of Bioshock or its sequel. Taking place after the death of Andrew Ryan and possibly parallel to Sophie Lamb’s final, desperate attempts at control, Minerva’s Den tells the story of the two programmers who built Rapture’s central computer. Your journey takes you into entirely new locales. While still a Big Daddy, your protagonist becomes far more defined by game’s end and the story of Minerva’s Den is one of haunting tragedy and redemption. The game offers up a new Plasmid, a very effective new weapon, a few new Tonics, and Trophies. There’s also a fun subquest and quicker “defend the Little Sister” segments. While this expansion lasts roughly eight hours (more if you’re trying to complete the subquest), it feels very complete, and in no way overstays its welcome. Minerva’s Den brings to mind the magic of the original Bioshock, and offers a more satisfying ending than Bioshock 2 did. Now we have to wait almost two years for the next iteration of the franchise, but I assure you that Bioshock Infinite looks incredible even at this early stage. I’m actually replaying this game, but I have a good reason. When I first bought the game, I played through very quickly. I loved it. 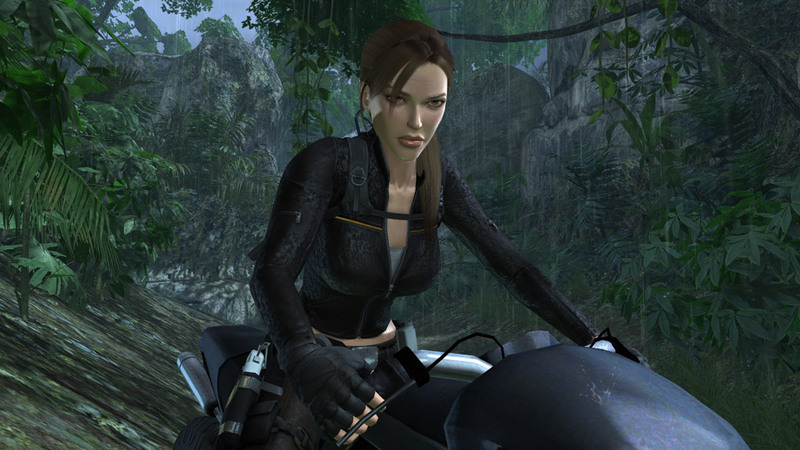 It was a graphical leap above Tomb Raider: Legend and Tomb Raider: Anniversary while retaining the excellent gameplay of those titles. 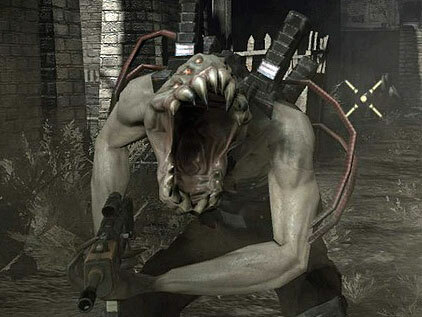 Underworld, however, suffers from some bugs and performance issues. 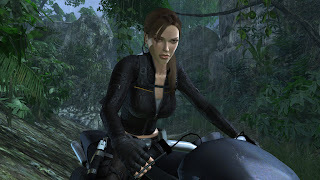 It’s very easy for Lara to get stuck on geometry or misjudge jump distance or direction during a jump. You have to babysit the camera every step of the way, although this does lead to unexpectedly, but pleasant, looks right down Lara’s shirt. During gunfights and certain platforming sequences, however, the camera is a real burden. The game looks absolutely drop-dead gorgeous—one of the best-looking games on the system as far as I’m concerned—but that graphical fidelity comes with a steep price: framerate issues, especially when bloom lighting is a part of the scenery. I really do like games of this ilk, however. 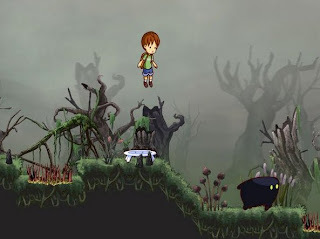 That is, games that feature a bunch of environmental puzzles and platforming. I’m replaying the game because it updated a year or so ago to include Trophies. Sadly, they are not retroactively applied. So despite completing the game—including finding 100% of the pickups and unlocking Lara’s terrible “bonus” costume (it's a palatte swap)—I didn’t get any Trophies for my efforts once the patch was downloaded. So over the past year, I’ve been slowly replaying the game, only recently getting back into it. Thankfully, I remember where all the really hard-to-find pickups are, but I imagine some backtracking will be required to find the more common treasures. There are only two levels left, and the last one is incredibly short (basically a lead-up to a boss sequence), so I should have this in the bucket before too long. I’m excited to try Lara’s new game, Lara Croft: Guardian of Light, which is already out on the 360 but launches toward the end of this month on the PSN. It’s been getting amazingly good reviews. Here’s a list of games I play from time to time—basically, when I get around to them. I can say with unwavering honesty that I have never played a video game that’s as self-aware and over-the-top as Bayonetta. I enjoy it immensely, but it exists well within the realm of a genre I’m not usually a fan of. At its core, it’s a 3D brawler, but more akin to Devil May Cry and Viewtiful Joe than God of War. It is fast-paced, requires some modicum of precision, and is mission-based. None of this is surprising given the fact that the developers worked on…Devil May Cry and Viewtiful Joe before this. It is an overtly sexual game, though not in the way you’d think: there are no bikini-clad Dead or Alive goddesses here. Bayonetta herself is fully clothed, but adopts a handful of moderate-to-heavily suggestive poses and positions while destroying her angelic enemies. At the same time, the whole game is ridiculously campy. It’s an interesting dichotomy that works for me. Plus, the game was half off. I’m early in the goings, and I imagine things will become steadily more complex the farther I go down this particular rabbit hole. My motivation for buying this old-school, genre-defining RPG was twofold. First, it is at the top of my “Secret Shame,” list. These are games I have always meant to experience but never got around to. When Chrono Trigger first came out on the DS several years ago, I almost picked it up, but grimaced at the patented Square Tax that jacked the price up beyond normal DS standards. I was reasonably certain the price would fall in the coming months. This did not occur. My copy was recently procured secondhand, using the remaining store credit I had at the cursed Play ‘n’ Trade, thus breaking my ties to that merchant and revealing my second motive for purchasing the game. It’s a great game so far, although the combat system has demanded some adjustment. If you’ve played the Penny Arcade Adventures games, you’ll have a better understanding of it, though it’s faster-paced in Chrono Trigger. I still don’t like Akira Toriyama’s art, though. It’s taking me an ungodly amount of time to finish this game, as I’ve had it since November. It’s not terribly challenging; it’s just slow-moving, and I’m a rampant completionist, so I’m compelled to find all of the treasures in each level. I’m halfway through the third world and I genuinely feel like I’ve seen it all, and that everything from here on in is just going to be repetitious. I’m probably wrong (I often am), but that preconceived notion has held me back from just finishing the damn thing. I should mention that this is a beautiful, hand-drawn game in which you can hug the blob. How this simple mechanic has not kept me invested is a genuine mystery. This is one of those games I bought based on recommendations from podcasts. Generally, I like it. I just haven’t gotten very far. It starts out as a more focused linear story but quickly turns into a WWII Grand Theft Auto game. The controls are a little wonky. The main character is a rabblerousing Irishman who does the kind of building-climbing usually reserved for an Assassin’s Creed game. Unlike those games, however, you have no real way of defending yourself against enemies once they spot you, since they tend to be heavily armed Nazis. So there’s a lot of trial and error, which isn’t necessarily my thing. I haven’t touched this game in awhile, but I do want to get back to it. This is another game I got at Fred Meyer when they were trying to free up shelf space. There are two distinct parts to this strange game: Uncharted-like shooter segments and surprisingly wonky air combat that’s littered with bugs. The story is semi-interesting (This is completely untrue. –Ed) and the main character is voiced by Nolan North, so that’s something. The graphics are pretty standard fare, nothing really stands out, and the enemies can be surprisingly intelligent but insanely cheap. So far, I like Dark Void Zero, a “lost” NES game released for DSiWare, a lot more than this game. However, it’s not terrible, so I pop it in every now and then to get a little farther. Every gamer has a nefarious backlog of games he or she bought (usually for cheap) but haven’t gotten around to playing. Mine isn’t terrible, and someday I’ll get around to playing these games. This game, about a colorful blob who literally paints the town red (or blue, or green, etc.) 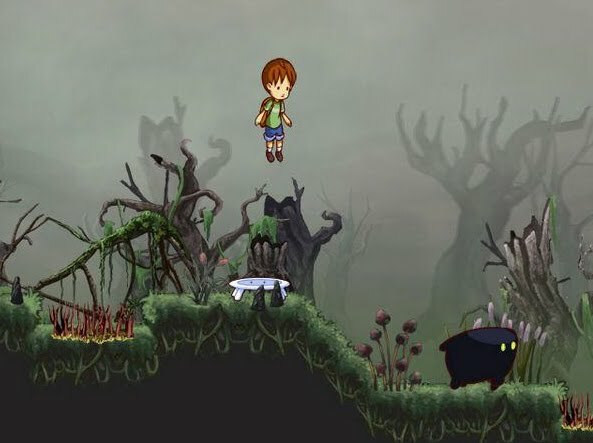 was given great marks by my own website (http://www.nintendoworldreport.com/) and it looks really fun. I like the art style and the idea of splattering paint all over a city. The only thing that’s got me nervous is the fact that you have to wiggle the Wii Remote to jump—obviously a shoehorned “motion control” gimmick. I love Insomniac. They made all the Ratchet & Clank games, after all. But a first-person shooter set just after WWI involving an alien takeover? I’m intrigued, but I’m also a little hesitant. Aside from the SyFy plotline, the game was a PS3 launch game and probably doesn’t perform as admirably as more modern shooters. This was another Fred Meyer sale game. I know I should try it out, but I haven’t had the energy. This is the sequel released in 2008 or 2009 (I can’t remember) that I bought when it, too, was regaled to the bargain bin (at Fred Meyer, no less). Since I haven’t played the first game, I sure as hell haven’t played the second one, which I hear is better in some ways, worse in others.